BROOKLYN—Flourishing instead of fading in the fourth quarter, the Nets extended their first season in Brooklyn.They need one more victory to set up the biggest game here yet.Brook Lopez had 28 points and 10 rebounds, Deron Williams added 23 points and 10 assists, and the Nets won 110-91 on Monday night, cutting the Bulls’ lead to 3-2 in their first-round playoff series.Recovering from a collapse two days earlier that sent them home on the brink of elimination instead of tied, the Nets battered the Bulls on the boards and forced the Bulls into being the team that wilted down the stretch. “We came out very aggressive, as we have the past few games. I think the difference was just we sustained it for essentially a full 48 minutes tonight,” Lopez said. Andray Blatche scored 10 of his 13 points in the fourth quarter and Gerald Wallace had consecutive baskets in the finishing surge as the Nets finally pulled away in a game they led most of the way, but never by too much.Two days after rallying for a 142-134 triple-overtime victory, the Bulls were outscored 15-1 at the finish and failed to set up a second-round series with Miami. Instead they will host Game 6 on Thursday. If the Nets win that one, they would host Game 7 on Saturday.Nate Robinson had 20 points and eight assists starting in place of point guard Kirk Hinrich, who bruised his left calf in Saturday’s game. Bulls rall from 14 down in final 3 minutes of 4th quarter, and outlast Nets in Triple Overtime for a 3-1 series lead-Robinson goes off in second half. Nate Robinson scored 34 points, and the Bulls wiped out a 14-point deficit late in regulation and beat the Brooklyn Nets 142-134 in triple overtime Saturday and take a 3-1 lead in the first-round playoff series.The Bulls were trailing 109-95 with less than four minutes to go in the fourth quarter when Robinson put the Bulls on his back and carried them to the wild victory.He scored all but five of his points after the third quarter, including the first 12 in a 14-0 run that wiped out the deficit. Then, with 2 seconds left in the first overtime, he banked in a go-ahead jumper over Deron Williams.Joe Johnson answered with one of his own to send it into a second overtime, tied at 121. The Bulls had a chance to win in the closing seconds of the next extra session, but Joakim Noah was blocked, and the game went to a third overtime.The Bulls finally pulled away after Williams (32 points) drove for a layup to pull Brooklyn to 133-130 — the only points for him after regulation — with three minutes left.Luol Deng answered with a basket to make it a five-point game, and Nazr Mohammed came up with two baskets in the final 32 seconds to help preserve the win.He scored on a jump hook, then grabbed the rebound and scored with 19 seconds left after Carlos Boozer made a free throw and missed the second, making it 140-134.The Bulls will try to wrap up the best-of-7 series at Brooklyn on Monday. The Nets are going to have to dig deep to win three in a row after they wasted a prime chance to draw even with with the Bulls and steal back home-court advantage.After Robinson scored 12 straight at the end of regulation, Boozer capped that tying run with a layup with about 55 seconds left.Brook Lopez then hit two free throws, but the Bulls tied it again when Noah put back his own miss with 23 seconds left. Williams then missed a jumper and Wallace had his layup blocked by Jimmy Butler with a second left, sending the game into overtime.It looked as if the Bulls would win when Robinson banked in a runner off one foot over Williams with two seconds left in OT. But after a 20-second timeout, Johnson caught a pass at the top of the key and nailed a floater at the buzzer, sending it into double overtime.The Bulls were leading 127-123 after Deng fed Noah for a dunk with 1:18 left in the second overtime, but Johnson quickly quieted the crowd with a three-point play.Robinson then fouled out when he charged into Williams with just over a minute left. Lopez got fouled with 48.7 seconds left and made the first free throw to tie it at 127 before missing the second. Boozer got the rebound, but Luol Deng missed a jumper with 30 seconds left. Johnson then missed one for Brooklyn with about six seconds left. Noah was blocked by Lopez, the ball bouncing out of bounds, and the game went to a third overtime after the inbounds pass deflected off the Bulls center and hit the rim. NOTES—the Bulls have never lost a Plaoff Series in which the had a 3-1 lead….Nets coach P.J. Carlesimo said before the game that he talked to Gerald Wallace about his role after the veteran forward wondered where he fit with the team. Wallace wasn’t thrilled after sitting out the entire fourth quarter in Game 3. “Hopefully, we’ve done a better job of letting Gerald know the things that are important for him to do to help us be successful,” Carlesimo said. Another road thrilling win(4th staright)for Rush, 64-63 in OT over Iowa. DES MOINES—The Chicago Rush won their fourth consecutive game of the season Friday evening, defeating the Iowa Barnstormers 64-63 in overtime at the Wells Fargo Arena in Des Moines.Despite the high final score, neither team could make any noise coming out of the gate. Iowa quarterback JJ Raterink overthrew his receivers, and Rush quarterback Carson Coffman could not muster a good enough look to find his. After a 38 yard field goal attempt by Jose Martinez failed, Raterink took back over and found his stride. His eighth pass of the night found receiver Marcus Harris in the corner of the end zone, giving Iowa a 6-0 lead. Coffman followed it up by throwing his first interception in three weeks, and Raterink quickly made the Rush pay with a quarterback sneak that found the end zone, extending the lead to 13-0.Right as it looked as the game might be a repeat of Week 1, Coffman found Reggie Gray in the end zone on three consecutive drives. His 39, 18, and 34 yard connections gave the Rush 21 points in a twelve-and-a-half minute period. Raterink was also spot on, conducting two scoring drives of his own in that time span. After one more score by Iowa left 47 seconds to go in the second quarter, Coffman put together a six play drive that took time off the clock and most importantly, resulted in a score. This time it was Jared Jenkins’ turn, hauling down a six yard touchdown pass to give the Rush a 28-26 lead heading into halftime.The second half was full of ups and downs for the Rush, despite Coffman’s game becoming even more efficient. His three connections to three different receivers took his first drive down to the one yard line, and he did the rest with a quarterback keeper. As Raterink was attempting to get a few points back, Jorrick Calvin picked off a pass to Marco Thomas, providing the Rush with the ball and their first notable momentum of the night with a nine point cushion. After numerous Iowa penalties kept giving the Rush new life on the resulting possession, Coffman found Gray once again in the end zone to cap off a six minute drive.Just as the Rush were about to put it away for good, Iowa responded. After regaining eight points on the ensuing drive, it took the Barnstormer defense only one play to get the ball back after a Ter’Ran Benton interception. They quickly marched down the field and reclaimed eight more, as Thomas’ second touchdown of the night evened the game up at 42. With the scores clearly giving Iowa momentum, the fifth Coffman-to-Gray touchdown broke their backs yet again. A four and out by the Barnstormers gave the Rush the ball back, and like clockwork, Coffman found Gray for his sixth touchdown of the night, tying a Rush franchise record for touchdown receptions.Raterink was not one to go quietly though, as he quickly found Harris on a 42 yard connection to bridge the gap to seven points with just over seven minutes remaining. After the Rush could not respond, Iowa tied it up with another Thomas touchdown, leaving just under 12 seconds to go in regulation. A Martinez attempt at a game-winning field goal never came to fruition as the snap was wide.In overtime, it was much of the same as Iowa scored less than three minutes in, with Harris catching his fourth touchdown of the night in the corner of the end zone. The Rush didn’t blink, methodically marching down the field and coming within one after a Kelvin Morris touchdown run. After a timeout by the Rush bench, the decision was made to go for a two point conversion, which would end the game regardless of its result. Coffman took his snap and promptly found Jenkins in the back of the end zone to win it for the Rush, advancing their record to 4-2. The Rush will return home on Saturday, May 4th to face the Philadelphia Soul. Even with the Presidents’ Trophy already in their possession, the Blackhawks are surging into the Western Conference playoffs.Patrick Kane and Jonathan Toews scored 3:28 apart in the first period, and NHL-leading the Hawks beat the Calgary Flames 3-1 on Friday night.Marcus Kruger added a goal in the third period for the Blackhawks, who are 11-1-2 in their past 14 games. The Blackhawks (36-6-5) will wrap up the regular season on Saturday at St. Louis and carry the NHL’s best record into the postseason.Although the Blackhawks dominated at times, they needed splashes of outstanding goaltending against Calgary to maintain their lead and momentum.Corey Crawford was sharp in making 25 saves and keeping the Blackhawks ahead throughout. The only goal he allowed was Chris Butler’s short-handed tally — Butler’s first goal in 65 games. The Blackhawks clinched the Presidents’ Trophy, given to the NHL team with the best regular-season record, on Wednesday. Joey MacDonald stopped 35 shots in the final game of the season for the Flames (19-25-4), who failed to qualify for the playoffs for the fourth straight year.Although the game had no postseason implications, both teams said was hardly unimportant. “The game still meant a lot,” Crawford said “We want to be playing our best hockey going into the playoffs. Kane, tied with Toews with a team-leading 23 goals, echoed the sentiment. Kruger scored his first goal in 32 games.The Flames skated without several injured regulars, including Alex Tanguay, Jiri Hudler, Curtis Glencross, Tim Jackman, and rookie Sven Baertschi. Calgary coach Bob Hartley was forced to use a lineup loaded with young players.Although the Hawks controlled the game early and jumped to a 2-0 lead, the Flames got back into it. After Butler’s goal midway through the second cut the deficit in half, Calgary came within inches of tying it on several occasions. Hartley didn’t fault the effort he got from his young, patched-together lineup. Ray Emery, who is 17-1, sat out because of a lower body injury, so Carter Hutton backed up Crawford.Entering the game, Crawford and Emery had combined to give the Blackhawks the NHL’s lowest team goal-against average at 1.97. The last time the Blackhawks led the NHL defensively was in the lockout-shortened 1994-95 season when Hall-of-Famer Ed Belfour played 42 games as their No. 1 goalie.Kane gave the Hawks a 1-0 lead 9:34 into Friday’s game.After Patrick Sharp’s shot toward an empty net deflected off the shaft of Calgary defenseman Mark Cundari’s stick, Sharp jumped on the loose puck behind the net. He fed Kane, who beat MacDonald on the short side from close range.Toews made it 2-0 moments later when he swept into the crease and popped in a rebound of Brandon Saad’s shot from the slot.The Blackhawks had several prime chances early in the second, but MacDonald turned them aside.Butler cut it to 2-1 at 10:43 of the period with a screened high shot from 50 feet. The drive breezed past Calgary’s Ben Street and got past Crawford for his first goal in more than a year.Crawford made a point-blank pad save on T.J. Brodie in the opening minute of the third, and another close-in stop on Matt Stajan’s tip-in attempt to keep the Blackhawks ahead.Kruger extended the lead to 3-1 at 7:06 with a shot from the right circle that beat MacDonald high on the stick side. It was his first goal since Feb. 15. NOTES—Emery has been bothered by a lower body injury the past two weeks and hasn’t played a complete game since April 15. He started at Edmonton on Wednesday, but left the game with 6:11 left in the first period…..Dave Bolland missed his second game with a groin injury…..The Blackhawks recalled nine players from Rockford of the AHL on Friday, but none played against the Flames…..Baertschi sat out because of a groin injury. He had a seven-game point streak, with three goals and seven assists. Bulls start and finish slow, but dominate in-between–Beat Nets for 2-1 Series lead. Every play near the basket looked like a traffic accident. There were long scoreless stretches. Shooting from outside was a dicey proposition.It was ugly for everyone but the Bulls. This was their type of game.Carlos Boozer had 22 points and 16 rebounds, Luol Deng added 21 points and 10 boards, and the Bulls held off the Brooklyn Nets 79-76 in Game 3 of their first-round playoff series Thursday night.The Bulls had no field goals and two foul shots in the final 5:46 of the game, but still managed to beat the Nets for the second time in the postseason. They will try to grab a 3-1 lead when the series resumes in a quick turnaround Saturday afternoon.Brooklyn shot 35 percent for the second straight game. Brook Lopez had 22 points and nine rebounds, and Deron Williams finished with 18 points on 5-for-14 shooting.Deng led the way as the Bulls grabbed control in the third quarter for the second consecutive game. The All-Star forward scored 12 points in the first 4 minutes of the period, seemingly scoring at will against Gerald Wallace as the Bulls turned a seven-point halftime advantage into a 16-point lead.Deng connected on four long jumpers before he drove inside for a three-point play off a foul on Wallace. A free throw by Boozer made it 54-38 with 7:36 remaining.Brooklyn made one last charge when Lopez had eight points in a 10-2 spurt that trimmed the lead to 77-74 with 14.4 seconds left. But Nate Robinson and Joakim Noah each hit a free throw and former Bulls guard C.J. Watson missed a 3 at the buzzer. Playing on a bad left foot, Joe Johnson had 15 points for Brooklyn, while Noah’s foul shot was his only point of the game while dealing with his own right foot injury.The Nets cruised to an easy victory in the playoff opener and flopped in Game 2, when they shot 35 percent and managed only 11 points in the third period of a 90-82 loss on Monday night that handed home-court advantage to the Bulls. There was no word on Johnson until the starting lineups came out right before Game 3, but coach P.J. Carlesimo was more focused on Brooklyn playing with more aggression and getting off to a fast start than whether the guard was going to be able to play.That emphasis worked at the beginning, but it quickly fell apart when the Nets went cold again on offense and the Bulls started to find their rhythm on both ends of the court.Williams had eight quick points, matching his total from all of Game 2 and helping Brooklyn to a 17-5 lead with 6:25 left in the first quarter. The Nets then went scoreless for the next 6 1/2 minutes and missed 25 of 26 shots overall while the Bulls surged into the lead.Hinrich made a layup, Marco Belinelli hit two foul shots and Boozer made a jumper to close out a 28-4 blitz that made it 33-21 with 5 minutes left in the half. But the biggest highlight was a pick and roll with Robinson and Taj Gibson, who finished it off with a poster-worthy dunk over Kris Humphries. NOTES—The Bulls handed out red flashlight key chains as part of their “See Red” playoff campaign, and the lights dotted the stands when the Bulls starting lineup was announced. … The Nets haven’t won a road playoff game since a 96-91 victory at Toronto on April 21, 2007. … Hall of Famer Scottie Pippen, who helped the Bulls win six NBA championships in the 1990s, received a huge ovation when he was shown on the videoboard in the first half. LAKE FOREST—Looking to help shore up one of the NFL’s worst pass blocking units, the Bears selected offensive lineman Kyle Long out of Oregon with the No. 20 pick in the first round.Long, the son of former Raiders Hall of Fame defensive lineman, Howie Long, is regarded as being remarkably athletic for a 6-6 lineman that weighs upwards of 310 pounds. A two-sport athlete, Long’s fastball reached the mid-90s at Florida State before he decided to concentrate on football.Long spent two seasons at Saddleback Junior College, one at defensive end, then transferred to Oregon for the 2012 season. After starting four games for the Ducks at left guard in 2012, Long entered the NFL Draft when his petition for another season was denied by the NCAA. What a shock! Rose officially ruled out of game three vs Nets. Bulls coach Tom Thibodeau said Thursday that Derrick Rose has once again been ruled out of a professional basketball game. He will not play vs. the Nets in Game 3.I had this idea, just a fantasy, really. Rose lists Rose as active pre-game but says he’s not playing. Then, all of a sudden, the pre-game introduction order is different. There’s a pause from announcer Tommy Edwards after Joakim Noah, the music goes silent. 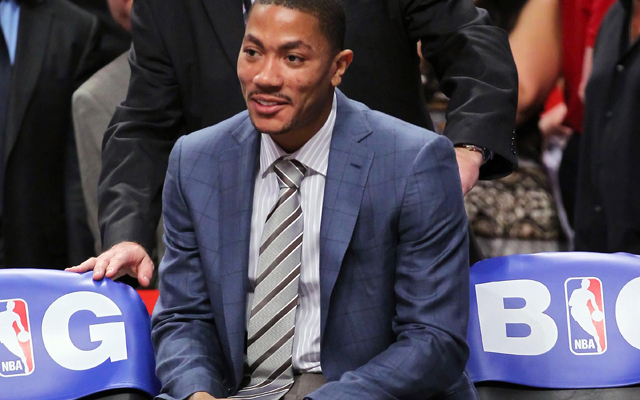 Then, “AT GUARD … FROM CHICAGO …” and the crowd goes berserk as Rose is introduced as a starter. It would be one of the most dramatic moments of the season. It would be incredible. It would put to rest this whole awful saga that has people questioning Rose’s commitment and toughness. Sigh.Instead, the Bulls will try to once again find a win without their best player. The drama continues. EDMONTON—The Blackhawks (35-6-5) held off the Eastern Conference-leading Pittsburgh Penguins for the top regular-season record in the NHL.Jonathan Toews, Patrick Sharp and Johnny Oduya also scored for the Blackhawks, who have gone 10-1-2 in their last 13 games and clinched the league’s best record for the first time since 1991.Nail Yakupov scored for the Oilers (17-22-7), who lost for the ninth time in 10 games and are headed toward another high draft pick.Thanks to their 3-1 win over Edmonton Oilers on Wednesday the Blackhawks clinched the best record in the NHL for the 2013 season and won the Presidents’ Trophy for the second time in franchise history.The 1990-91 Blackhawks also won the award with a league-best 49-23-8 record.The Blackhawks have been at the top of the NHL standings from pretty much the start of the season and would have needed a pretty incredible slump to lose their grip on the best record thanks to their ability to gain at least a point in their first 24 games, starting the season with a 21-0-3 record.They haven’t really slowed down much since then as their .681 points percentage over the past 22 games would still be the fourth best mark in the NHL this season.Of course, having the best record in the regular season is no guarantee for success in the postseason. At least not recently. The last team to win the Presidents’ Trophy and the Stanley Cup was the 2007-08 Detroit Red Wings, while four of the past seven Presidents’ winners have lost in the first round, including three of the past four (last year’s Canucks, the 2009-10 Capitals, and the 2008-09 Sharks). That’s not to say it’s a bad thing to finish with the best record in the league, it just hasn’t worked out for those teams over the past few years.By securing the top seed in the Western Conference the Blackhawks will face the No. 8 seed in the opening round, which could be either Minnesota, Detroit, Columbus, or Dallas. Detroit seems like the best team that would have a chance at upsetting the Blackhawks in a best-of-seven series.